These days, most people agree that plastic pollution is a big problem. Nothing we use for a few minutes should be allowed to contaminate our oceans and rivers and threaten the health of humans and wildlife for centuries. Because so much of our plastic pollution comes from single-use items such as cups, bags, straws and containers, people also agree that we should focus on those products first. But exactly how should we address the problem of single-use plastic pollution? Taxing or placing a fee on plastic items such as grocery bags is a halfway solution at best. An extra 5 cents per bag discourages some consumers from using plastic and provides the government with revenue, but many consumers have no qualms about paying a nominal fee for what they consider convenience. For example, Montgomery County, Maryland, outside Washington, DC, instituted a nickel fee for plastic bags in 2012. However, from 2014 to 2015, large chain grocery stores there actually distributed more of the bags, according to the Washington Post. A tax on a social problem like plastic works well only if it causes consumers to stop acquiring the taxed item altogether. At 5 or even 10 cents a bag, the current plastic taxes clearly aren’t enough of a deterrent. At first glance, this is an alluring option. It’s the have-your-cake-and-eat-it-too narrative. We take single-use plastic items, and instead of throwing them into landfills, or allowing them to reach the oceans, we recycle them into new plastic items, supposedly creating a righteous and circular economy. 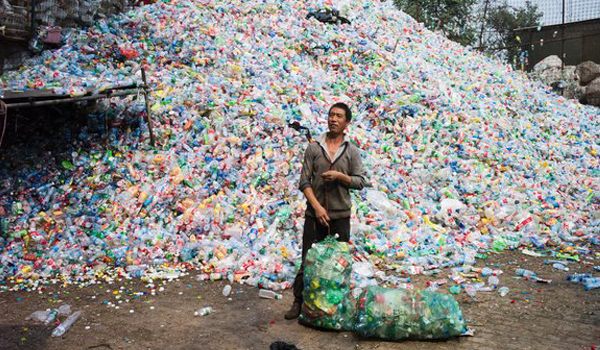 This is the strategy that the plastic industry has trumpeted for some time. But consumption has costs. It takes energy and resources to manufacture every item we use, including recycled ones. Recycling single-use plastics encourages consumers to buy and toss more plastic instead of reusing items. Also, recycling can be difficult — both logistically and financially. Consider the chronic issue of containment. Almost a third of our single-use plastic items never make it to the the landfill. They’re small, lightweight, and chronically spill out of garbage cans or blow out of landfills. Also, people litter. How do you fix that? More education? Harsher penalties? More policing? Better equipment? These are all good ideas, but will they work? And who pays for them? Let’s say we magically solve the containment issue. There’s another problem. Plastic recycling requires specialized equipment that most of the country does not have access to. Equipment is expensive and used plastic is a mostly unprofitable commodity. With cities and municipalities across the country already struggling to pay for education, infrastructure and social programs, how on earth can they afford to upgrade their recycling capacity? They can’t, and plastic companies touting the recycling fix aren’t funding these programs either. Ban single-use plastics. That’s what the UK has decided to do, starting as early as next year. Why not? It’s viable, given that we already have more sustainable alternatives (glass, paper, bioplastics, ceramic, and more). And when given a mandate, major companies will comply and lead the way. For example, McDonald’s is phasing out plastic straws and replacing them with paper products in the UK. People lived for thousands of years without straws, plastic bottles or styrofoam takeout containers. We clearly don’t need single-use plastics — neither the detrimental side effects of drilling for the fossil fuels needed to make them, nor the pollution after we’re done with them. Quite the opposite: what we need to do is act on the fact that what seems convenient to us now will create insurmountable hardships for our children and grandchildren. A ban is the most effective way to rid us of single-use plastics once and for all. Sometimes the simplest answer is the right one.